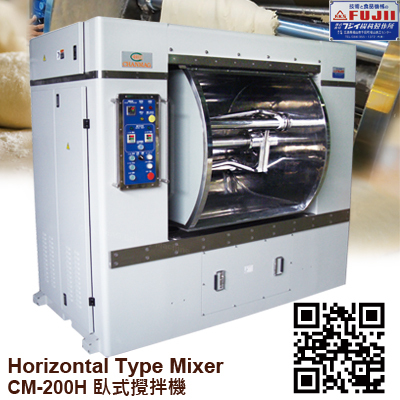 CHANMAG CM-200H Horizontal type mixer suitable for higher humidity of dough is designed with Z-type stirred increases 3% more water absorption of dough and obtains a much homogeneous mixtures, enhance products quality, save cost and extend shelf life of breads. Mixing bowl is with the cooling water circulation system to reduce the temperature of dough during mixing, to enhance and stabilize the forming quality of dough and control quality on each lot of dough. Fixed receiving bowl device to assure the dough can automatically output and easy for operation. 1.Available for fast, slow 2 steps mixing speed and also manual automatic timer function, it is easy to control operation process and product quality. 2.Automatic to output dough after mixing finished, if added with fasten device for dough collecting bowl, there is no operator required for take out dough. 3.Easy to clean sealed type mixing bowl, to ensure hygienic of product.